Our recent visit to the Mendoza wine region in Argentina left me wanting for more of the delicious wine from this sun-kissed part of the world. Fortunately for me, just about the time we arrived home, Wine.com decided to hold a sale on several Argentinian and Chilean wines (Yes, we stopped on the other side of the Andes, too, to sample the wines of Valle del Maipo). I ordered a variety of chardonnays to be delivered. 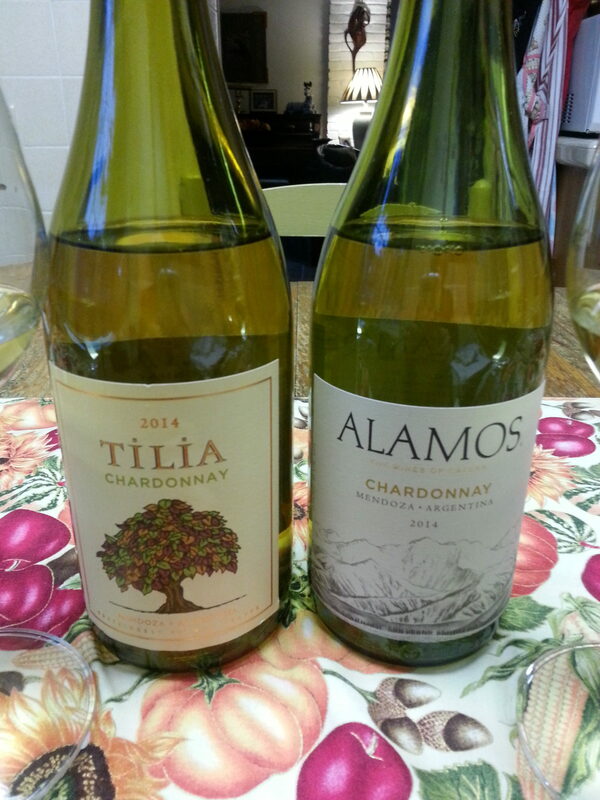 Today we are tasting the 2014 Alamos Chardonnay and the Tilia Chardonnay from Mendoza. This wine has a brilliant, light yellow color. Enjoy hints of vanilla in the nose, followed by tastes of stone fruit and ripe apple, layered with vanilla. It is well-balanced and full-flavored, very much to my liking. It also has a lovely finish that lingers on my palate. The wine sold for $9.99 on Wine.com. Cultivated by the Catena family for over 100 years, Alamos vineyards lie in the foothills of the Andes Mountains. This wine pairs nicely with roasted chicken or pasta dishes with a cream sauce. We also sampled it with a soft brie cheese and found the pairing to be delightful. This wine has slight hints of toasted oak and vanilla in the nose. The wine itself, however displays a ripe citrus flavor. The color is also a brilliant, light yellow like the Alamos. The Tilia is well-balanced, lighter bodied than the Alamos, with a clean, refreshing finish. We purchased it for $10.99 from Wine.com. Tilia is sourced from sustainably farmed vineyards in the Eastern and Southern regions of Mendoza. Pair with a mild white cheese or grilled chicken or grilled vegetables. Of the two wines, I found the Alamos to be more to my liking. I lean towards the fuller-flavored, fuller-bodied chardonnays. And for the price, I could see myself stocking up on some more Alamos Chardonnay.